LIBERTY, TX -- The Trinity River seems like it'll keep rising until the cows come home. And this Sunday that's exactly what they did. With six hundred head of cattle stuck on a 40 acre island, dozens of cowboys and volunteers set out to save the herd. "The 40 acres is dwindling as the water comes up," said Liberty County Sheriff's Department Captain Ken DeFoor. "This is really an unprecedented effort." "It's bad and getting worse by the minute," added cowboy Jarrod Land. "Calves are really struggling to get out." First, they had to get the cattle off the "island" and into the water. Then they used air boats to help guide the frightened cows back onto land. "This here is not their regular route to come out to be penned or anything," explained Land. "The water is high. It's scary for the cattle. It's scary for a grown man back there right now." But they did it and rescued one after another, slowly and carefully getting them back on dry land so they could finish their eight mile journey straight down Highway 90 and into Dayton. 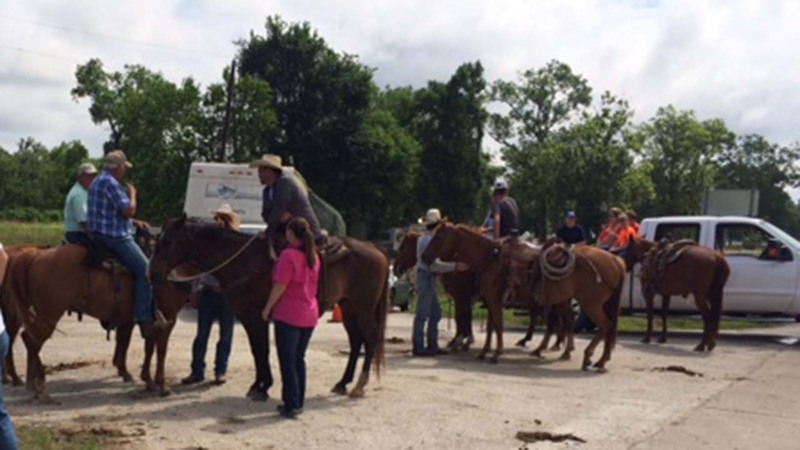 Liberty County residents lined the highway as if they were watching a parade, watching the once-in-a-lifetime spectacle hoof its way to a safe piece of land not close to the river.